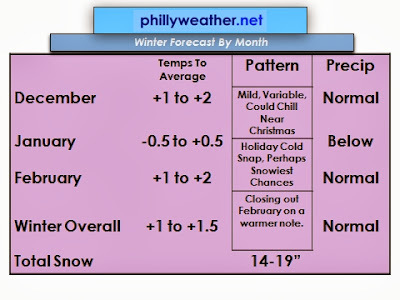 This is our eighth winter forecast here at Phillyweather.net -- we've produced a mixed bag of wintry results over the years -- some of them solid, others not-so-much. With the exception of temperatures in 2011-12, we've been pretty close to the mark in terms of getting that aspect of the forecast right. Snow is another story -- and we will say it time and again that snow is a wildcard on a seasonal basis. Even "good" setups don't always produce. We've seen a general tendency for a more amplified pattern take over from September on and we feel that we will see that continue through the winter. Amplified does not necessary result in a cold and snow scenario for us but we will likely see periods of warmth followed by periods of cool, rinse and repeat. Without the influence of blocky weather (NAO, AO) setting up shop, cold may be more fleeting than entrenched. It is winter -- it will get cold -- but the magnitude of chill this winter may not be on the order of what we dealt with in late January into February last year. Most of the indicators out there lean warm -- even if a Nino does develop, it may not develop in time to "save" winter for the snow starved nor set up in a position ideal to help influence a colder pattern for the eastern half of the United States. The best comparison winters out there -- from a Nino/Nina/neutral standpoint, to October temperatures, combined with similar Arctic Oscillation tendencies -- are last winter and 2001-2002. Neither of them were good from a snow or cold standpoint. It doesn't mean we won't be cold at all during winter -- I think the amplified pattern in place allows for *some* colder periods that last longer than others (the holidays into early January is our best guess for when that takes place). On the whole, we think it will be a milder winter...on the order of at least a degree, perhaps a degree and a half above average (36.3-36.8 degree range, average is 35.3). Warmest periods to average are probably the first three weeks of December and the last two weeks of February. 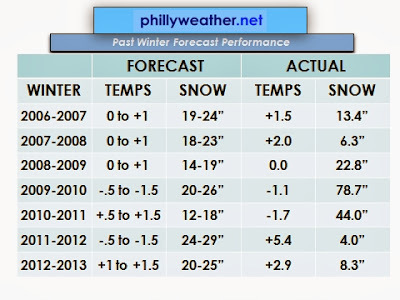 In terms of snowfall, we lean below average (21.8" is average) with our projection of 14 to 19 inches for Philadelphia. 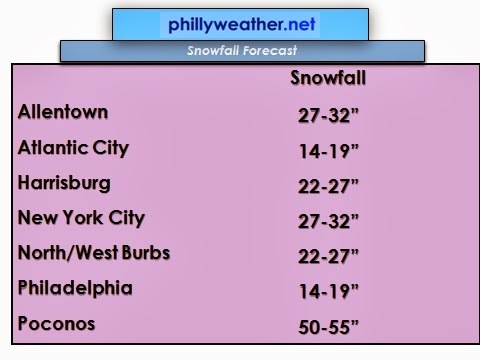 Most of the region should see slightly below average snowfall, with the Poconos closest overall to average as they get into the lower 50's on snowfall. The best time frame for snow looks to be in the middle and latter portions of January, a little earlier than our historical "peak" for snow. This would time roughly with us getting out of our colder look that sets up near the holidays. 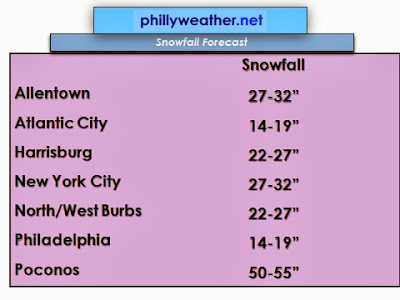 Snowfall in Philadelphia a wildcard, as usual, so snowfall seasonal predictions should be taken with larger grains of salt than temperature predictions. That said, warmer years do usually correlate to less snow (there are exceptions, of course!). 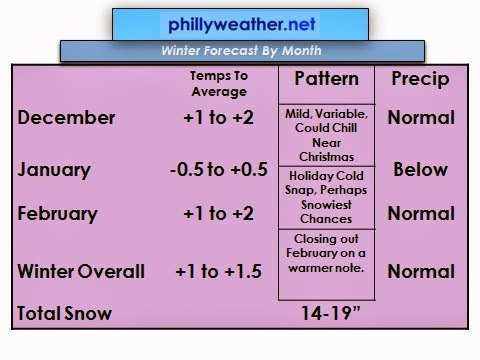 Given the odds of a relatively milder winter, the "safe" play is to go with less snow than average based on the odds. With that said, if we do get ten inches of snow, it would be more than last winter. Twelve gets us more than the last two winters combined. Philadelphia hasn't gone three winters with less than ten inches of snow since the early 1930's. Historically, such odds are tough to pull off...but are worth noting here in case we end up in a rarefied spot for winter.